Here at frenchtoastandindiepop we’re intrepid eaters and voracious researchers. Before we go anywhere we must find out about the food and make sure we don’t miss anything. 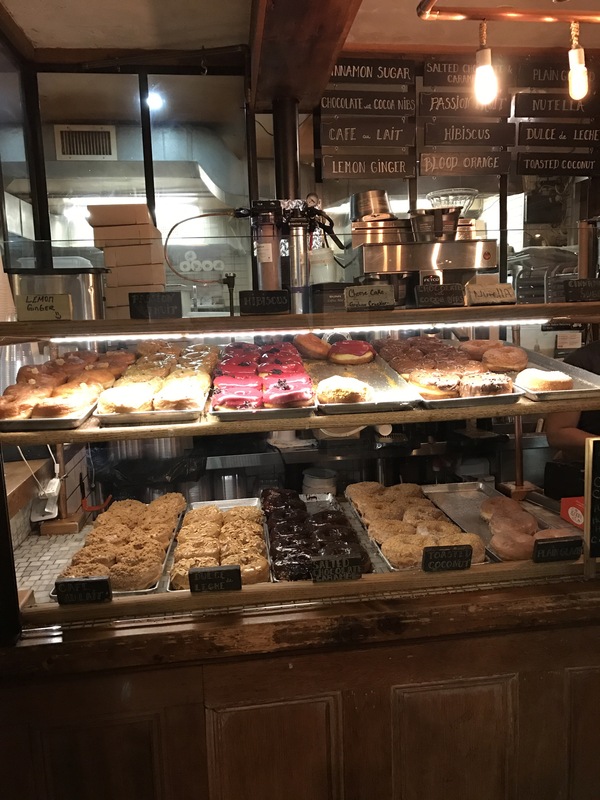 We stumbled across Dough Doughnuts when researching Brooklyn and our remote searching proved correct when it was one of the first places our Airbnb host recommended too. We walked to Dough on a dark and wet night. Freezing, but not quite cold enough for the sky to open into snow (damn!) the novelty of a doughnut shop open late and the need to explore drove us forward. If there’s one thing that defined Dough’s approach to doughnuts it was ‘big’. Big rings, big flavours. 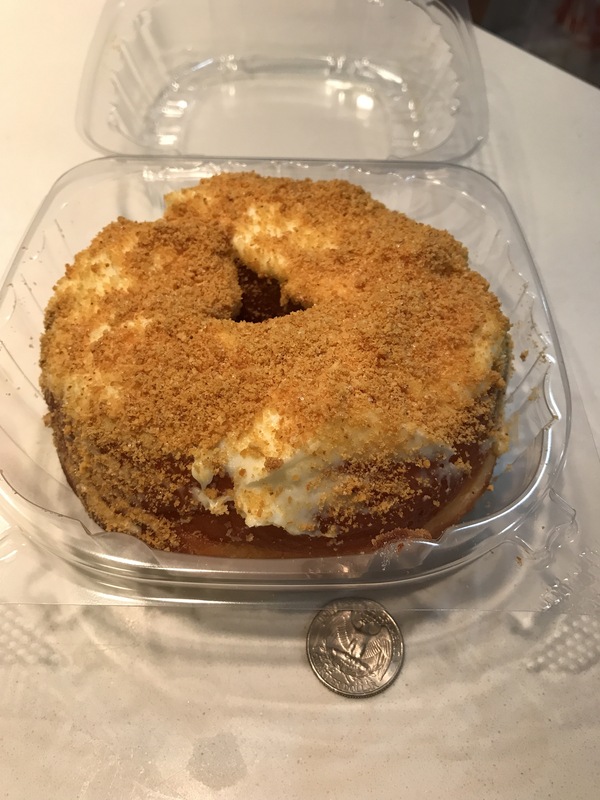 We went for an American inspired choice, the cheesecake doughnut with a graham cracker crumb. We can confirm that cheesecake and doughnuts are a match made in heaven, but you already knew that didn’t you? For tourists like us, this was an absolutely value adding selection! We also chose to sample the original glazed dougnut. This tends to be test of an establishment – if your original glaze is on point, you know the rest will follow! 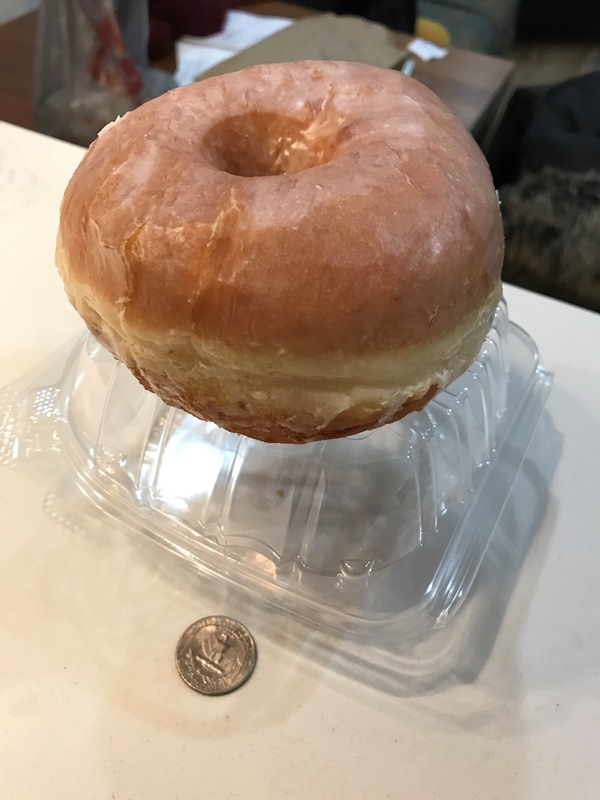 Dough’s OG had a light glaze over a very big yeasted doughnut. It was a good mix of topping to doughnut and despite the size wasn’t overwhelming. If you’re looking for impact in your doughnut, Dough really has you covered! Dough Doughnuts lived up to the hype. If you can’t make it to the flagship store in Bed-Stuy you can also find them at their stand-alone store in Flatiron, and food halls in Manhattan and Brooklyn!